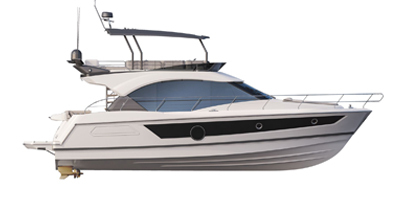 With a hull low on the water, the Sense 55 offers a satisfying feeling of confidence. 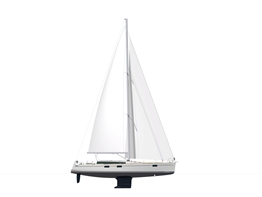 Minimal heel, perfect balance under sail and easy manoeuvrability combine to offer surprising sailing speeds and exceptional cruising comfort. The Sense 55 is not content with being seaworthy and safe. that create generous room and a delightful new lifestyle at sea. Ideally positioned at the centre of the boat, the two guest cabins have sliding doors. They are fitted out as private suites in which family and friends can stay and enjoy a pleasant amount of privacy. The master suite is a luxurious cabin with its own shower cubicle, separate toilets, office and many functional storage spaces. The cabin is generously proportioned and well ventilated. The option of leather clad furniture in the saloon, white lacquered doors on wall cabinets and a floor covered with ivory-coloured carpet render this cruiser exceptionally elegant. The clever layout of the starboard cockpit seats around a modular retractable table allows conversion of this space into a huge sunbathing area. Master cabin: island bed with marine mattress and slatted bed frame; lots of storage (up to 5 drawers, hanging lockers, etc. ), a leather dressing table and retractable 22" TV with motorized lift system (on option). Ensuite bathroom with shower separate from the toilet. Two guest cabins with ensuite bathroom and sliding door access. An ensuite bathroom with shower and toilet in each cabin. Central furniture incorporating an extra seat, 2 people, for the chart table. A 32" retractable TV on motorized lift system (option). Its location supports you in the galley when the boat heels and provides an additional grab rail. Master cabin: island bed with marine mattress and slatted bed frame; lots of storage (up to 5 drawers, hanging lockers, etc. ), a leather dressing table and retractable 22" TV with motorized lift system (on option). Ensuite bathroom with shower separate from the toilet. Two guest cabins with ensuite bathroom and sliding door access. Extra cabin accessed by the cockpit.